Pyrotek New Zealand was consulted by a school in Auckland to resolve the problem of excessive noise levels in classrooms. The poor classroom design was negatively impacting students and staff at Randwick Park Primary School in Manurewa, Auckland. Excessive noise from heavy rainfall on the steel roof as well as loud noise transmission between classrooms led to a serious problem affecting both students and teachers. A survey of 120 primary school teachers from seven schools in the Auckland area by Valentine and Wilson revealed problems such as excessive noise in classrooms, higher stress and irritability among teachers, and the need to strain their voice to be heard in the classroom. This research formed the basis of their academic journal article titled ‘Classroom Acoustics – A New Zealand Perspective’, with the collected survey responses revealing the following information: 71% of teachers surveyed reported the noise generated within the classroom was a problem; many teachers commented that classroom noise was often at a significant enough level to increase teacher stress and irritability; and 35% of teachers complained that the level they needed to speak at strained their voice. In a Ministry of Education (2007, p.12) report titled ‘Designing Quality Learning Spaces: Acoustics’, research indicates the ambient noise level in New Zealand classrooms ranges between 28 and 60 dB. Ambient noise is the natural level of noise when a classroom is fully occupied; higher levels of ambient noise can negatively reduce a student’s ability to concentrate. Design shortcomings at Randwick Park Primary School led to noise being transmitted between classrooms, distracting the students, and making it hard for them to concentrate and for teachers to teach. The noise problem was worse on rainy days when the constant drumming of raindrops falling on the untreated steel roofs even drowned out the noise transmission between classrooms. This required both students and teachers to speak in loud voices just to be heard and understood effectively in competition with neighbouring classroom noise and rain noise. These circumstances provided a far from ideal teaching and learning environment at the school. Following consultation with Pyrotek Noise Control New Zealand on a solution to reduce rain-noise and noise transmission between classrooms, two soundproofing solutions based on Pyrotek’s industry-leading flexible mass-loaded vinyl noise barrier Wavebar, were specified. Wavebar was specified for its outstanding acoustic properties, flexibility and durability. 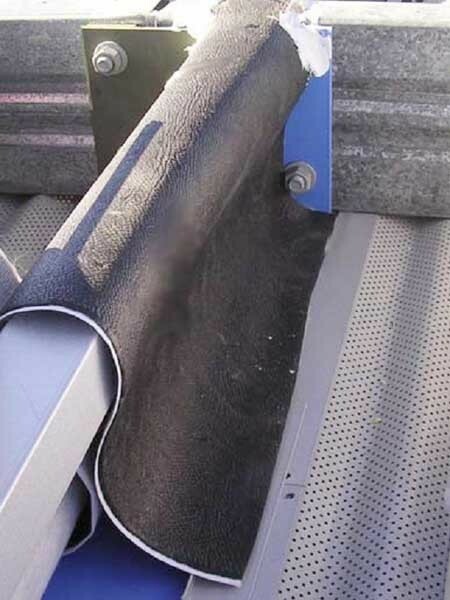 Wavebar was used to stop sound transmission between classrooms by creating a barrier between the ceiling and the roofing iron in the roof cavity. The ceiling in the classrooms consisted of a corrugated perforated panel, designed only to reduce reverberation within the rooms. A 50mm thick glass-fibre blanket with a commonly used roofing iron was installed over this panel. An open pathway above the internal dividing wall between the classrooms allowed noise to travel through the ceiling tiles and the cavity and down the neighbouring classrooms’ ceiling, aided significantly by reflections off the underside of the roofing iron. Pyrotek specified a double layer of 8kg/m² Wavebar to be installed directly above each dividing wall in the roof cavity, effectively blocking the transmission path of noise travelling between the rooms. Two layers of 8kg/m² Wavebar, each featuring an STC of 30, improved noise reduction. All the Wavebar barriers in the ceiling cavity were fully sealed using a flexible mastic sealant to provide completely airtight seals between flashings, purlins and the roofing iron above. The ceiling and the glass-fibre blanket installed in the classrooms were not designed to provide attenuation of rain noise. To achieve a quiet classroom environment during heavy rain, Pyrotek specified 8kg/m² Wavebar in the design, requiring that the Wavebar be laid down as a blanket beneath the roofing iron and above the purlins, creating a complete barrier against noise transmission. Pyrotek supplied custom-cut rolls so that the roll weight was more manageable and joints were supported by purlins. This also reduced labour and wastage during installation. Instead of the conventional method of butting the edges together and leaving ‘leaks’ for the noise to travel through, all the joints were over-lapped at least 50mm, thus creating a continuous acoustic barrier extending from the outer edges of the external walls across the entire roof area. Following the installation of Pyrotek’s sound barriers, the teachers at the school were very pleased with the outcomes.